"The phone is already dead." That's what Microsoft visionary and HoloLens honcho Alex Kipman said this week. The "phone call is making a comeback." That's what one tech publication said this week, based in part on wishful thinking by MIT egghead and Reclaiming Conversation author Sherry Turkle. The answer is yes. Phones are definitely dead. Phone calls are forever. But the reasons why may surprise you. Confession: I love landline phones. They deliver reliable conversation without awkward delays, weird outages or "can you hear me now" gymnastics. They don't have to be charged. You can always find them, assuming they don't have a cordless handset. Both Google, with its Home device, left, and Amazon, with the Echo, right, are working on adding calling functionality to their virtual assistant appliances. Real landline phones (not to be confused with the landline-like VoIP variety) stream voice over copper, which also delivers power. So if you've got a blackout, the phone still works. Landline phones are great for business, because they're reliable. If you've got a desk, that's where you're going to make calls anyway, so you might as well sacrifice mobility for reliability and voice quality. But landline phones passed an ominous milestone this week. A Centers for Disease Control and Prevention survey revealed that a majority (50.8%) of U.S. households are mobile-only, which means that now, and for the first time in 100 years, most U.S. homes do not have a landline phone. Wait, the Centers for Disease Control and Prevention? What do phones have to do with disease? Turns out landline acceptance is associated statistically with risk aversion. We mobile-only people are far more likely to drink and smoke too much, while the landline people are teetotalling wallflowers by comparison. (For example, 29% of Americans without landlines binge-drink alcohol, but only 18% with landlines do.) We mobile-only folks are a health and safety risk, apparently. If landline phones offer higher quality and reliability, why are people getting rid of them? The biggest factor is convenience for the caller. Landline phones are connected to a place, not a person. You call a building, not an individual. And when somebody wants to reach you, they'll call your mobile phone, not the building where they think you might be. Some disgruntled landline phone owners say the only incoming calls are telemarketing. Landline phones don't have a "block caller" button, so the phone spam just keeps on coming. The only solution is to get rid of the landline phone. The trends clearly favor mobile. But smartphones aren't so great for phone calls either. The batteries die, leaving you with no phone. Sometimes the connection's weak or non-existent, so you can't make calls. People are tempted to make and take calls while driving, which is dangerous. Most of the problems and irritations with phones and phone calls are universal to all types of calls. Unwanted telemarketing calls. Wrong numbers. Phone tag. When you want to leave a message, there's usually a long wait. Phone calls are synchronous, and it's hard to "catch people at a good time" for a call. Some of us accept these inconveniences as the price we pay to make calls. Others simply avoid phone calls and mostly use messaging services. I'm here to tell you, however, that all these phone problems will soon be solved. Mixed reality by itself won't solve the problems that phones have. They'll just make calls more fun. Also: I think we're more than a decade away from a HoloLens that's mobile enough to carry or wear all the time. A better hint at the future of phone calls emerged in February when The Wall Street Journal reported that both Amazon and Google are working on adding calling functionality to their virtual assistant appliances — Echo and Home, respectively. This rudimentary vision of marrying voice calls with virtual assistant appliances involves using voice commands with a connected address book, then the use of the devices' speakers and microphones plus VoIP software to enable Skype-like voice calls over the internet. This isn't a very exciting idea. It merely extends to the appliances what smartphones can already do. When I call family members, I typically press and hold my iPhone Home button, and tell Siri to call the person. Siri connects the call, which proceeds normally. 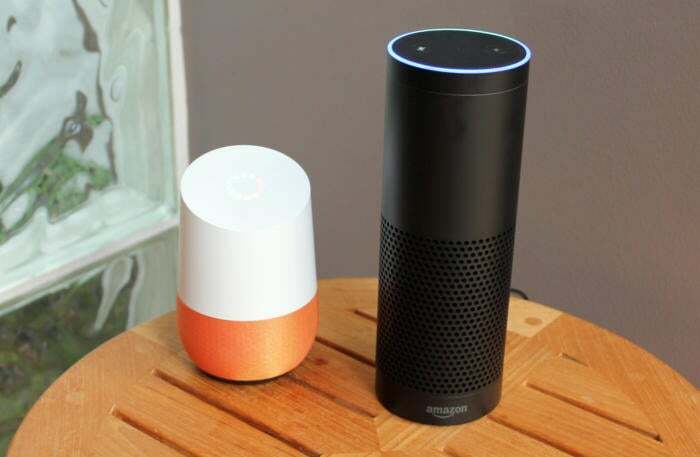 The Echo and Home reportedly would do the same thing, but with a better speaker and no option to take the call privately without reconnecting it to a nearby mobile phone (which could be done using an updated Alexa or Home app). A virtual assistant that dials the phone is nice. But what I really want is for it to answer the phone when somebody calls me. I want my virtual assistant to screen and schedule my calls, then listen during my calls to take notes for me and be available to perform other tasks. It's a safe assumption that virtual assistants will evolve to become more like human assistants. And helping with phone calls is what human assistants and secretaries have done since the telephone was invented. The integration of phone call functionality into a virtual assistant (or insertion of a virtual assistant into phone calls) is powerful, obvious and inevitable. I believe the first such device will come from Amazon and will be targeted at businesses. Here's why. In last week's column, I detailed the facts and implications of Amazon's new Echo Look virtual assistant appliance. I pointed out that Echo Look is a bedroom Echo. I also speculated that Amazon's rumored upcoming screen-endowed Echo would also be location-specific — a kitchen Echo. It's clear that Amazon wants to custom-tailor Echo hardware for specific use cases and specific rooms in your life. So let me describe the perfect office or business virtual assistant appliance. Let's call this fictional device the "Amazon Echo Chamber." Imagine a landline-style VoIP business phone that doubles as a speakerphone, with an always-present Alexa working as your secretary. When someone calls, you don't even hear the phone ring — Alexa answers the phone using voice. Let's say one caller asks Alexa if you can meet Tuesday for lunch. Alexa says no, but how about Wednesday. The caller agrees, and Alexa puts that on your calendar. In short, Alexa and the Echo Chamber would do with a voice interface what X.ai's Amy virtual assistant currently does via email — schedule and manage your meetings for you. The another person calls, and it's a telemarketer. Alexa answers the call, determines it's phone spam, hangs up on and reports the caller, and then and blocks the number. You never even know the call happened unless you ask Alexa. A third person calls, and it's your spouse. Alexa recognizes the voice or the number before your spouse even finishes asking if you're available and tells you over the speakerphone who is calling and asks if you want to take the call. You say "sure," pick up the receiver and have your conversation. A fourth person calls — it's a scheduled business call. When the call is over, you say: "Alexa, send me the notes on that call," and an attachment with meeting notes, action items, participants and other formatted data appears in your email inbox. This feature would duplicate what the Clarke virtual assistant already does — listen to your meetings on the phone and take formatted meeting notes for you. During that call, a fifth person calls. Alexa answers that call and informs the caller that you're in a meeting and asks if the caller would like to leave a message, which Alexa would play for you when you ask for your messages. It's interesting to note that no virtual assistant can intervene and interject during phone calls. But the Google Assistant does do that during Allo chat sessions. The Assistant pays attention to the content of text conversations and offers suggestions visible to both parties. The integration of virtual assistants and phone calls finally gives you a real virtual business secretary, your own personal Miss Blankenship. This Echo Chamber would sit on your desk and perform all kinds of functions, answering questions, scheduling meetings, and even performing narrow, department-specific tasks using Echo "skills" built in-house by and for your company. Integrating phone calls with virtual assistants completes and perfects both. It turns the virtual assistant into a real assistant that can act like a real secretary, and it turns the phone feature into something far more convenient and enjoyable. Best of all, this idea doesn't require an Amazon Echo Chamber phone. Lots of companies would build such a device (I just expect Amazon to get there first). And such functionality will be possible and desirable with your smartphone as well. For that matter, we don't even need smartphones. Appropriately provisioned hearables or smart glasses could do the job as well. In short, this is where phone calls are going. The existence of phone-call functionality as a smartphone app is temporary. The ultimate destination for phone calls is to become a feature of your virtual assistant. Virtual assistants can and will solve the problems that still plague both landline and mobile phones. They will eliminate telemarketing calls, voicemail and phone tag, and they will go a long way toward helping us cope with dead batteries and poor coverage (because our virtual assistants will answer the phone when we can't, then connect us seamlessly when we can). They will listen to our calls and do old-fashioned secretarial work for us during those calls. Yes, the phone is already dead. But the phone call has a glorious, virtual assistant-augmented future.